These days there can be no excuses for not knowing your distances, be that to the centre of the green, for example, or to carry a hazard off the tee. Some of the technology below has made it easier than ever for golfers to play with more confidence and commit to shots knowing they have an accurate yardage. 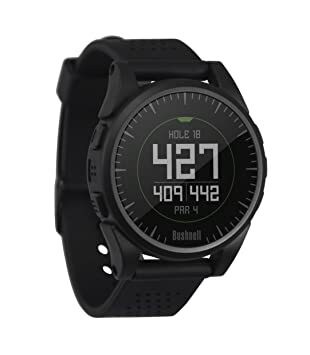 However, with so much choice on the market, it can be very difficult to decide which of the best golf GPS watches 2018 has to offer is for you, and within your budget. If you’ve made the decision to buy a golf watch, as opposed to a larger handheld GPS device or a laser rangefinder, you’ve probably already opted for simplicity – preferring a quick glance to get your accurate yardage. It’s then a case of deciding how many additional features you’d prefer to have. This feature-packed and stylish offering provides detailed full colour maps for over 40,000 courses on its large sunlight-readable colour touchscreen face. You can use its drag-and-drop functionality to measure lay-up distances and to move pin positions for added accuracy. 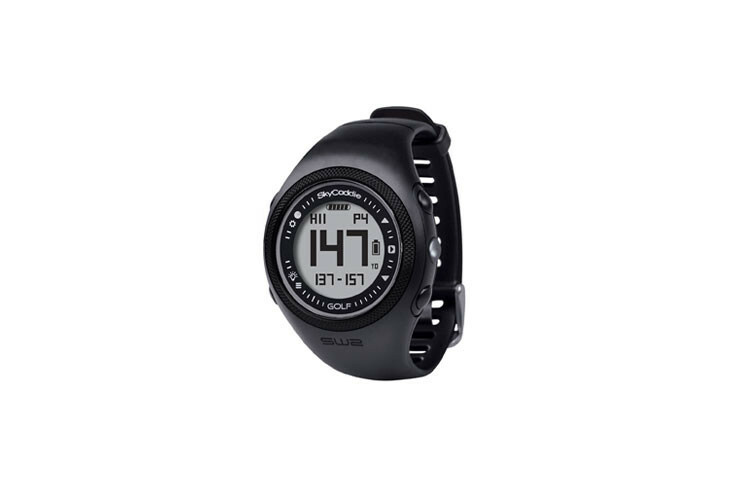 It can also be used to monitor runs, swims and bike rides for great additional value. If you want lots of functionality for under £200, this is a great option. It has a full colour touchscreen that allows you to view complete hole layouts as in the image above. You also get dynamic green view for accurate distances from your approach, as well as moveable pin positions for laser-like accuracy. For little over £200 you’ll find a watch that pairs via Bluetooth to the Bushnell Golf App to allow you to book tee times, view 3D course flyovers and receive notifications. The Excel also has improved battery life – lasting three plus rounds before needing a charge. Additional features include a colour display with auto brightness adjustment, pedometer, odometer and the ability to get up to four hazard distances per hole. SkyCaddie’s top-of-the-range GPS watch offers game-tracking with GPS accuracy when integrated with the SkyCaddie Mobile GPS App. 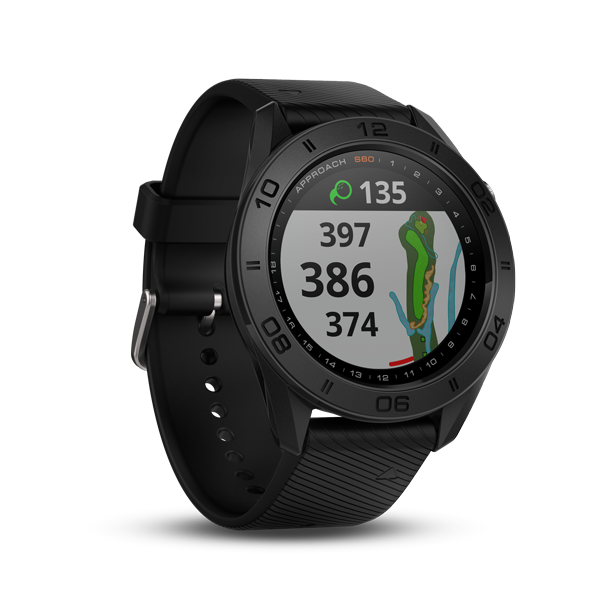 It’s core function is to act as a standalone GPS watch with SkyCaddie’s foot mapped hole data providing accurate distances at over 35,000 courses. Its built-in shot tracking system – when combined with SkyCaddie SmartTag club tags – allows golfers to track the club, location and distance of each shot for stats they can see on their mobile phone. Each captured shot is synchronised automatically in real time too, avoiding the need to connect to a computer after the round. It also boasts a multi-sport odometer that tracks distance, pace and speed for running or cycling. 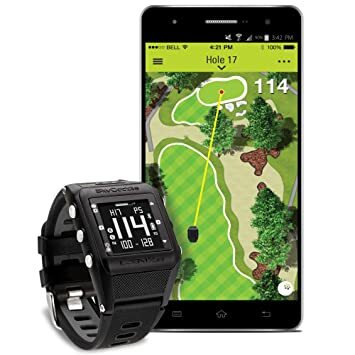 This GPS watch is designed to help you improve your game by detecting each time you hit a shot automatically, so your round can then be analysed using Tom Tom’s MySports app. It also boasts an auto scorecard alongside its distances to the green and key hazards. This simple GPS watch offers accurate distances for those of you who only want yardages at a glance. 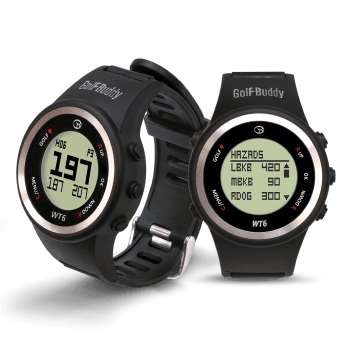 It has nine hours of battery life in golf mode and like the more feature based GolfBuddy WTX, has Dynamic Green View for improved accuracy when you find yourself out of position. This watch comes ready-to-play with SkyCaddie’s ground-mapped yardages that provide at-a-glance distances to the front, centre and back of every green. 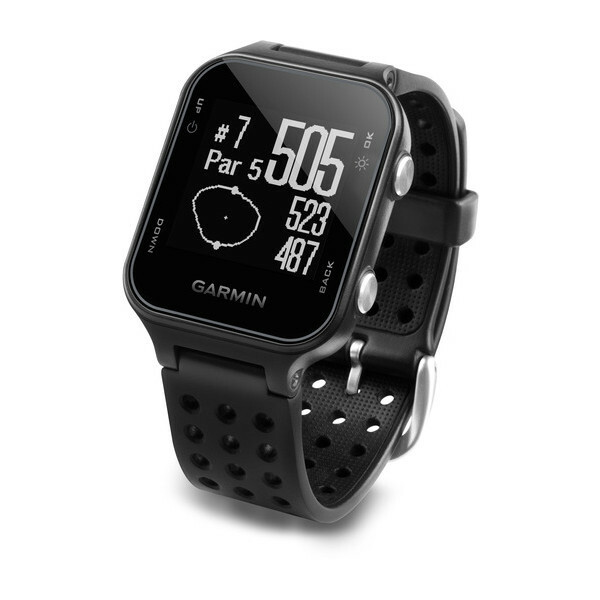 It will also automatically detect your course and advance between holes, plus it has a host of fitness features and a pace-of-play timer.